After one year of being constructed the escalators in Comuna 13 have proven to be a big help for the citizens living in Comuna 13. 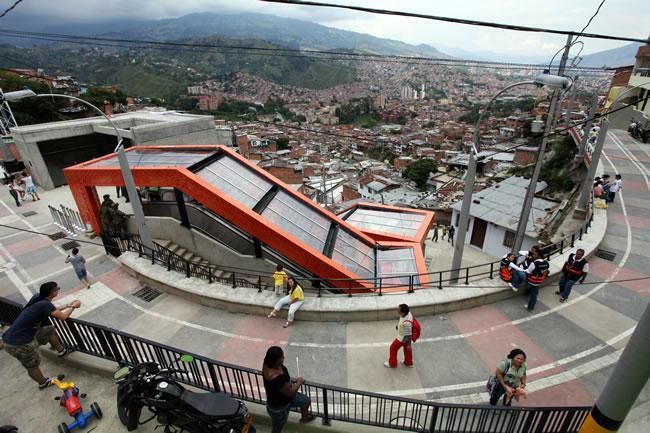 624,000 people have used the escalators in Comuna 13 since it’s inauguration on May 6th, 2012. Last year the city invested twelve billion pesos (roughly six and a half million U.S. dollars) into the project. The escalators convey about 12,000 people a week, 4,000 being children; the escalators replaced 350 steps up the hillside of Comuna 13. The most charming story comes to be the story of a 14 year old girl that has become the most famous guide on the escalators. Estéfany Jiménez Restrepo, a 14 year old girl from neighborhood La Independencia Uno, became a self-appointed guide on the escalators as soon as they were inaugurated. She has shown her piece of Medellin with pride to President Juan Manuel Santos; French designer Francois Girbaud; Río de Janeiro’s governor, Sérgio Cabral; and Banco Interamericano de Desarrollo president, Luis Alberto Moreno. Proven: is the past tense of the verb prove. To prove means to show or validate something through evidence or argument. Invested: is the past tense of the verb to invest. To invest means to put money into a project or a business with the hope of a return. Convey: is a verb and is synonymous with transport. Charming: is an adjective synonymous with lovely, nice, polite, attractive, pleasant, and fascinating. Self-appointed: is an adjective meaning to be selected by oneself. Pride: in this case is used as a noun. It’s the feeling of pleasure for your neighborhood or country. Paisas have a lot of regional pride.